A new Compliance tab has been added to our site . Access this tab for Physician and Client responsibilities and information on Limited Coverage Testing and Medical Necessity. The Histology Stain List has been updated and can be viewed in Requisition Forms under the Ordering Information Tab. UP Health System – Marquette Laboratory Services is a fully integrated, comprehensive provider of laboratory services to inpatients, outpatients, outreach clients and other community health care organizations. Our highly trained staff of 6 board-certified pathologists and 130 personnel are all dedicated to providing comprehensive technical expertise and excellent customer service. 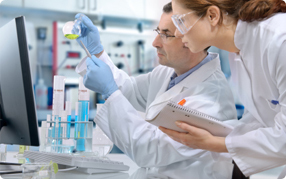 We provide the highest quality laboratory services with a full range of testing in Hematology, Chemistry, Coagulation, Urinalysis, Microbiology, Cytology, Cytogenetics, Flow Cytometry, Anatomic Pathology, and Transfusion. Laboratory test results heavily influence a majority of the management and patient care decisions made by physicians each day. We understand the responsibility that accompanies each and every specimen entrusted to us. Therefore, quality and exemplary patient care are never compromised. Period. Clinicians and their patients typically wait 2-4 days for biopsy results as a consequence of utilizing traditional overnight tissue processors. Here at UPHSM’s Reference Laboratory, we fully appreciate that waiting for results can be suffocating. Patients and their families need not only accurate answers, but answers delivered quickly.